Just in case you all thought I was getting a little too healthy/veggie/prissy with my cipollini onions and peas gremolata...don't worry, I still go ape for sinful sweets. This extremely kid-friendly recipe goes out to all my little monkeys (nine nieces and nephews!) in Atlanta and San Francisco. May you revel in indefinite sugar highs! 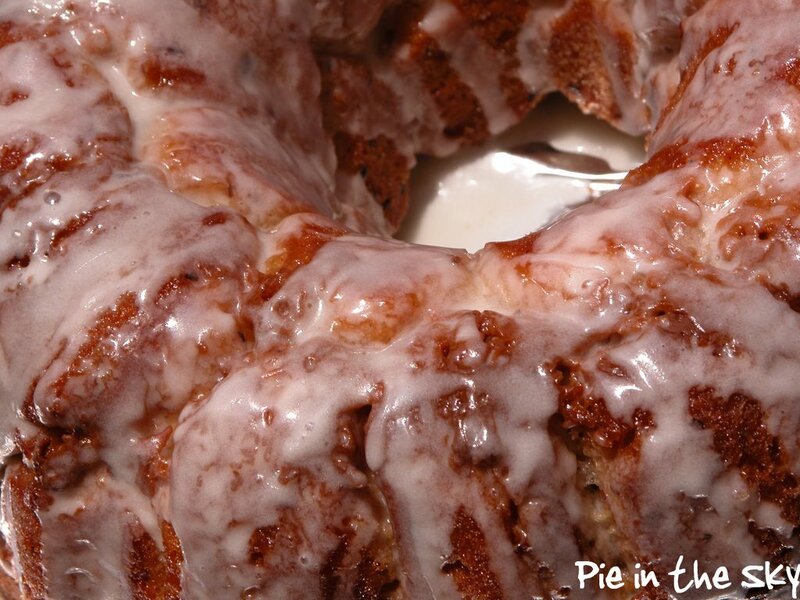 Coat the inside of the Bundt pan with cooking spray or butter and set aside. Melt butter in a bowl and stir in sweetened condensed milk until blended. In another bowl, mix the sugar, brown sugar, and cinnamon. Open one can of biscuits and separate. Cut each biscuit into four sections (you can do this step more efficiently by quartering the biscuits in stacks of two or three) and roll each section into a ball. Coat each ball in the sugar mixture, then place in Bundt pan. After finishing the first can of biscuits, drizzle half of the butter mixture evenly over the top of this first layer. Repeat these steps for the next can of biscuits. Sprinkle the remaining sugar over the top and bake in a preheated 350° oven for 30-35 minutes. While bread is baking, mix sugar, cream or milk, and vanilla in a small bowl with a fork. Add more cream if necessary for desired texture (the icing must be drizzle-able). When done, remove from the oven and let cool for a minute or two, then turn onto a plate and carefully remove the pan. (do this promptly or the bread will stick inside the pan.) While bread is still warm/hot, drizzle icing decoratively over bread. Enjoy! Eat by tearing off biscuit hunks, monkey style. i'm so glad you posted this recipe. one of josh's aunts makes monkey bread for family gatherings, but i can never remember to get the recipe from her. somewhere i have a savory version of the recipe that involves garlic cheese bread, and i'll see if i can dig it out for you next time i'm in the recipe boxes. now that splenda makes a brown sugar, i'm antsy to try to make this diabetic-friendly for josh. Oh, i bet J would love the savory version! As for diabeticking this recipe...well, bread is still bread, and there's nothing diabetic-friendly about biscuit dough...but substituting splenda for the sugar(the brown sugar isn't a necessity, btw, just my creative addition) and leaving out the sweetened condensed milk (also my addition) is a good start. 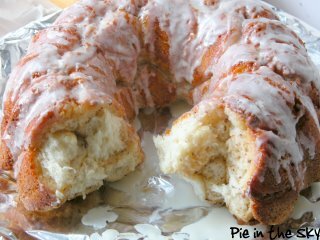 The icing is also optional, if splenda won't ice the same way...the bread is almost as yummy without it! Seriously, this is unbelievable. My sorry breakfast doesn't compare to this and now I want some very badly. I'm clipping this recipe for sure! Thanks, Ivonne =) The calories really are worth it - it's delicious! If you're a sucker for all things homemade (I tend to be this way, but I made an exception for the monkey bread) you can make biscuit dough yourself and use that instead. Hope you enjoy it =) Let me know how it comes out! A great memory, though, nonetheless; yours looks as deliciously sweet as I remember it. 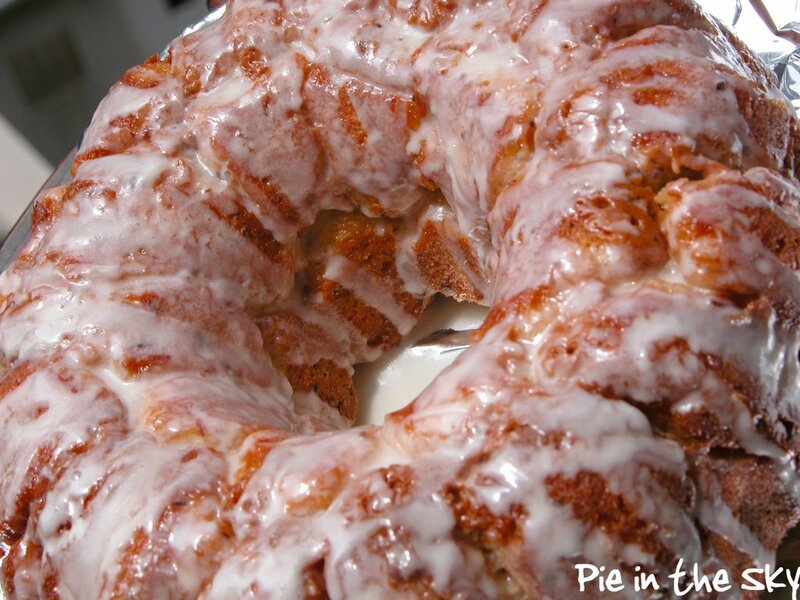 Kate, the monkey bread looks gorgeous and the recipe seems easy enough. Thanks so much for sharing. I just did a post lamenting that I couldn't find a good monkey bread recipe. Thankfully, a kind soul pointed me in your direction. You have a very delicious blog!